Going a bit off piste here. Not sure I can quite justify any link with garden design but still wanted to share with you. I took my family to the Wilderness Festival for the first time after having heard loads of great things over the last few years. I must say, it exceeded my expectations. And I'm coming back to the desk a better designer. This full immersion into the Wilderness has certainly got my creative juices flowing! This morning I was so lucky to be able to pop into the Garden Museum on a weekday for a (business) coffee. One of the best coffee in town. Plus I was able to take my coffee out and sit in the sun on one of their deckchairs in what must be one of the prettiest courtyards in London (a lesson in planting design by the iconic Dan Pearson). And I wondered: is this the best kept secret in the city? This place is a gem. Desperate for Spring to spring now..In the meantime, this briliant quote from Audrey Hepburn springs to mind (excuse the pun) and reminds me that Gardens are all about seasons and their anticipation, one must never lose hope, Spring always comes...even if it's a bit late.. I'm rubbish at crafts and even worse at finding time for it but at this time of the year, when it's cold and pitch black at five o'clock, and let's face it (despite previous post), I spend less time in the garden, it suddenly appeals to me. I have also discovered that I get so much pleasure out of displaying my handmade artefacts however imperfect and quirky that I now make sure each December to book a couple of nights in to do just that and nothing else. Well...almost as I have also discovered that I can combine said activity with getting together with a gang of girlfriends and some wine. This puts me right into the Christmas spirit and I find also helps with calming things down in the manic run up to Christmas. Joyeux Noel! The advent calendar is inspired by the brilliant blog, A Quiet Style. 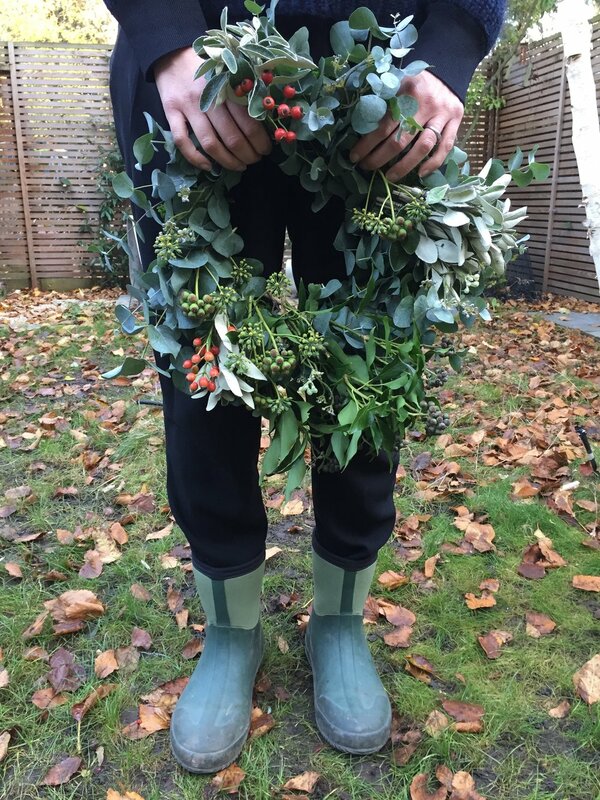 Some of the foliage has been harvested in my garden and some has been bought at the flower market. TIME TO (NOT) PUT THE GARDEN TO BED. This is a phrase I hear a lot at this time of the year and I find it slightly unnerving. In fact, if I’m honest it’s a phrase that goes completely against everything I believe in when designing a garden. Seasons should feature in gardens, they should be celebrated, yes, even winter. By putting their garden to bed, a lot of people mean tidying it all up, removing all fallen leaves and cutting everything down so that they can forget about it all until the spring. But even if it is true that everything slows down and that most plants and creatures go dormant, there is still life winter. There is still much to be admired and there are some plants that are in fact at their peak in winter: Sarcococca, Witch Hazel and Viburnum Bodnantense provide fragrance, Hellebores are definitely worth coming close too and many more. I love visiting gardens in winter when everything is quieter and not so in your face. Some herbaceous stand proud throughout the winter and display elegant seedheads and silhouettes and look enchanting covered with frost (a lot of ornamental grasses, verbena bonariensis, hydrangeas, etc..) . So don’t put your garden to bed. On the contrary, leave a pile of logs and fallen limbs in a corner, don’t completely eradicate the mess, leave a bit of it for hibernating mammals and insects. Leave some seedheads on, and don’t remove all the fallen leaves but push them away from the lawn into the beds to provide the more tender perennials with a natural mulch. ARCHITECTURE AND LANDSCAPE SPEAKING TO EACH OTHER. I like a pile of logs! Log walls have started to feature regularly in my gardens as an ornamental feature in their own right. Logs piled in an orderly manner are attractive and can anchor an area, add texture in the simplest, pared down but yet effective manner. The logs in this picture were sourced from a local tree surgeon, it was just a question of finding a tree surgeon with very particular attention to detail so that the logs had already been sorted in sizes and neatly stored in his yard. I have previously spent hours sorting logs so that they sit well together…never again! I love the contrast between natural material and their neat arrangement which turns the pile into a feature. I, of course, also love the fact that I know it will provide shelter to millions of insects (think stag beetles, habitat preservation, etc) and some small mammals. Which of course in my view adds a lot of value and makes them even more desirable as long as the logs are sourced locally (ideally on the developed site) and from a well managed forest. Get the structure right. My gardens have a high ratio of herbaceous and deciduous trees but I always try to get the bone of the garden right with a few strategically placed structural evergreens so that the garden doesn’t look dead in the deep of winter. Don’t cut everything back, retain some seedheads standing tall and proud throughout the winter. Ornamental grasses, perennials such as Verbenas, and shrubs such as Hydrangeas look great even after the flowers have died and very elegant under a layer of frost. Plus they are a valuable food source for birds and provide an overwintering home for ladybirds and lacewings. Attractive bark and silhouette. Choose some trees that look great even after they’ve lost all their leaves such as betula utilis var. jacquemontii, which will brighten up any garden with their brilliant white stems and slender, elegant silhouettes. Multi- stemmed Amelanchier and Acers will also provide interest and look like sculptures. Dogwoods are excellent if you have a large garden and can plant them en mass somewhere with their bright coloured bare stems (as per picture here). Introduce fragrance. Some shrubs are a must (for large gardens only): Viburnum bodnantse “Dawn”, Sarcococca confusa and hookeriana and Hamamelis x intermedia and mollis will surprise and entice you with their exquisite fragrance when all your senses seem to have gone numb with the cold. Get inspiration. Some gardens reveal their true inner beauty on cold and bright winter days. They are worth visiting even when it’s freezing: Hyde Hall in Essex, Anglesey Abbey and Bressingham Gardens (where this picture was taken) in Cambridgeshire. We came to the West Country for a few days for some much needed exercise and to dust the cobwebs away post-Christmas and before going back to school. For once I felt like I had my finger on the pulse when I managed to squeeze a visit to the Design Museum in its new location on High Street Kensington last Sunday. This in itself felt very good, being one of the first few discovering the new museum , but the real treat was the inspired Fear and Love exhibition #FearandLove designed by Sam Jacob Studio. This brilliant exhibition is such a perfect choice to mark the re-opening of the museum. It sets the tone and gives you a taste of what to expect. I will certainly be keeping a close eye on the future exhibitions program. Its title Fear and Love and its timing are just perfect, genius really, in these strange post Brexit/ Trump times and you leave with plenty to think about. Finally a hose that's not orange or bright green, and a hose holder that you don't need to hide away.